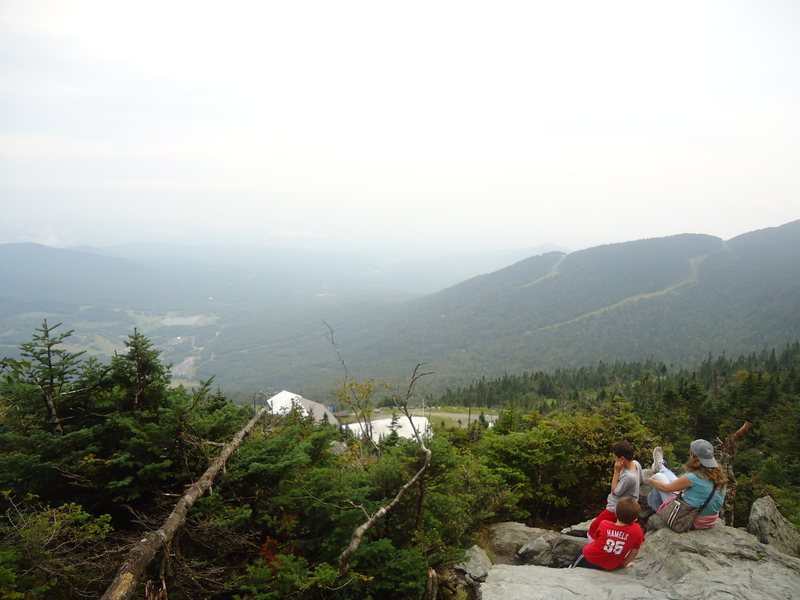 Before arriving in Stowe, Vermont, I knew almost nothing about it. One might attribute this to the fact that I am (1) a native Californian; (2) the child of native Californians, and (3) not a skier. Were it not for my husband (who is none of these three things) and who suggested we check out Stowe, I might never have visited. And that would have been a shame. We loved Stowe. It boasts many family-friendly inns and resorts. The Grey Fox Inn’s two-bedroom condo, with mountain views and fully equipped kitchen, let us spread out and relax. Situated along the Stowe Recreation Path (more on this award-winning 5-mile stretch of heaven later), the inn’s location inspired even non-runner me to set out for a jog one morning, such was the beauty of the setting. 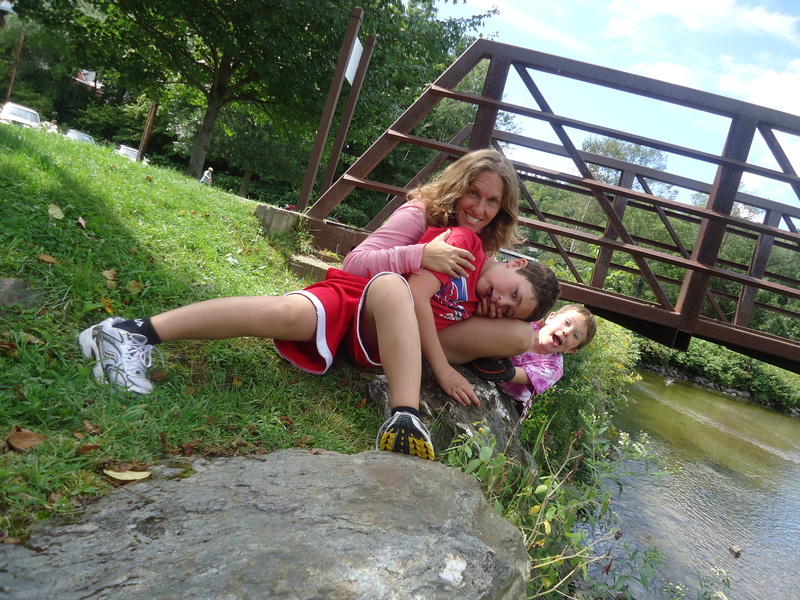 For my children, their enjoyment of Stowe was a simple matter of speed. 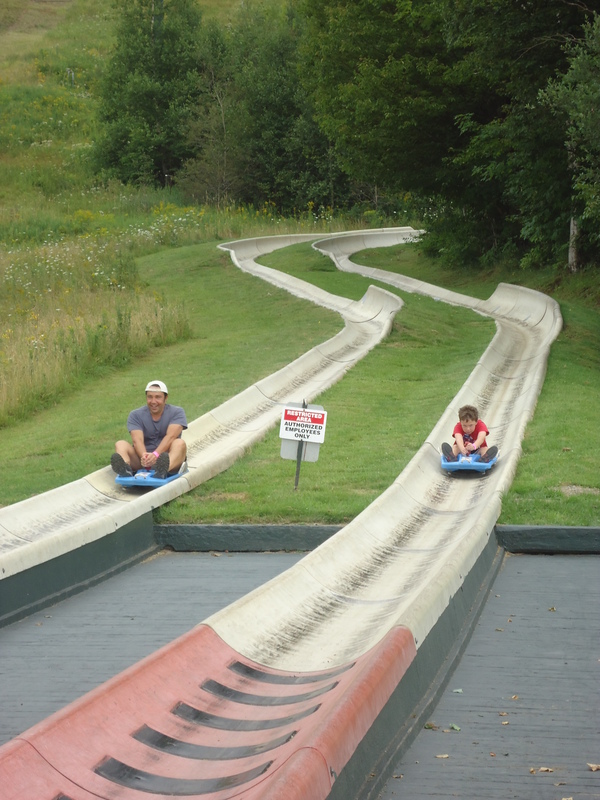 They proclaimed The Alpine Slide at the Stowe Mountain Resort head and shoulders above all other entertainments. This is saying a lot for kids fresh off of rope swinging into crystal clear Lake Todd; jet skiing in Lake Winnipesaukee; seeing Mary Poppins on Broadway and a Yankees game; swimming in the Long Island Sound; tubing down the Delaware River; petting and feeding giraffes and elephants. 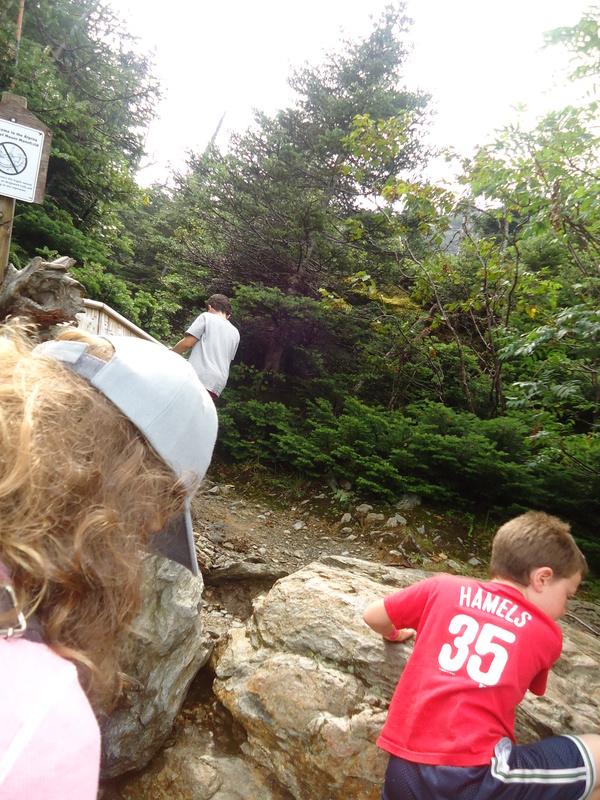 When we rode the gondola and disembarked high on the mountain, the kids immediately clamored to go back to the Alpine Slide. But we wanted to enjoy the mountain a wee bit. 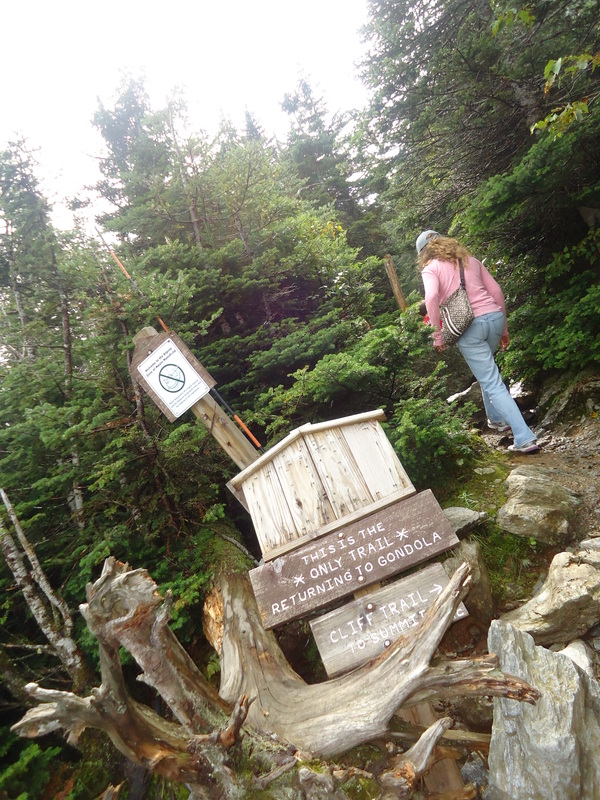 We noticed a small wooden sign that said, “This is the only trail back to the gondola.” Why not take the tiniest detour, we thought, a short scenic hike on our way back to the gondola? We wondered why a woman wished us “good luck” as we stepped onto that path. 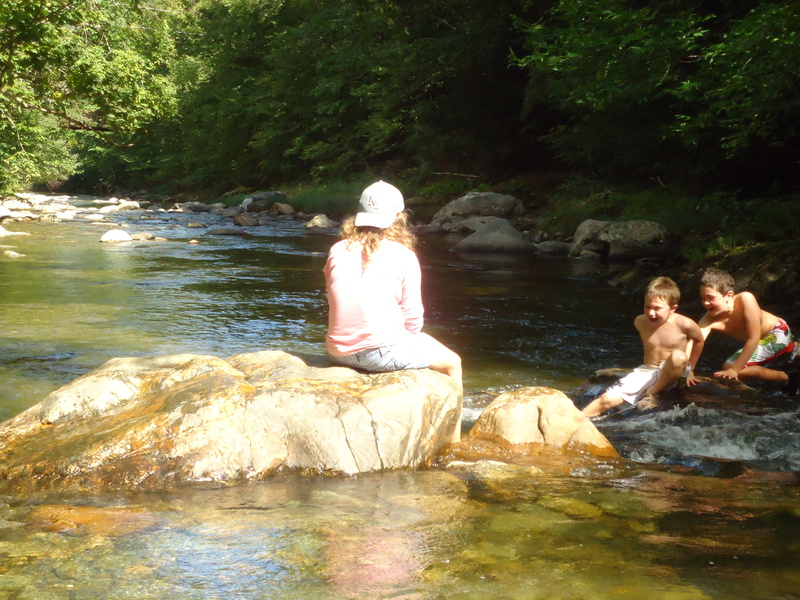 It soon became obvious: it was rocky terrain made slick by running water. “Are you sure this is the way back?” Aaron and Emmett challenged us. Eventually we reached a boulder taller than Christopher, and we finally admitted that not only was there no way we could get over it, this was no simple loop back to the gondola. We could see it far below us. We stopped for a rest and to take in the view, then turned back. To minimize the kids’ “I told you so’s” as we descended, I told them about the von Trapp children (whose Trapp Family Lodge is one of several exceptional resorts in Stowe), who had to climb the Swiss Alps…in the snow…at night…with Nazis chasing them (at least, that’s what I know from The Sound of Music). 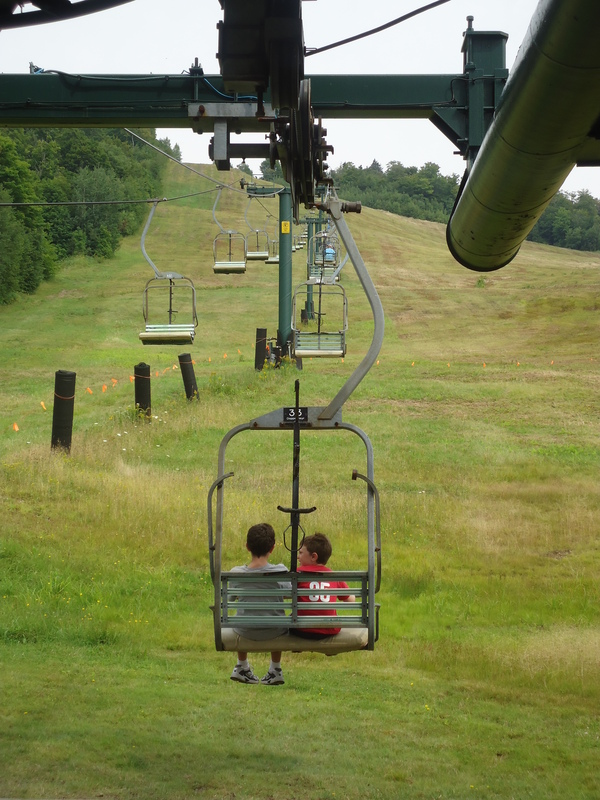 That quieted them and before we knew it, we were back at the gondola, ready for the ride down. 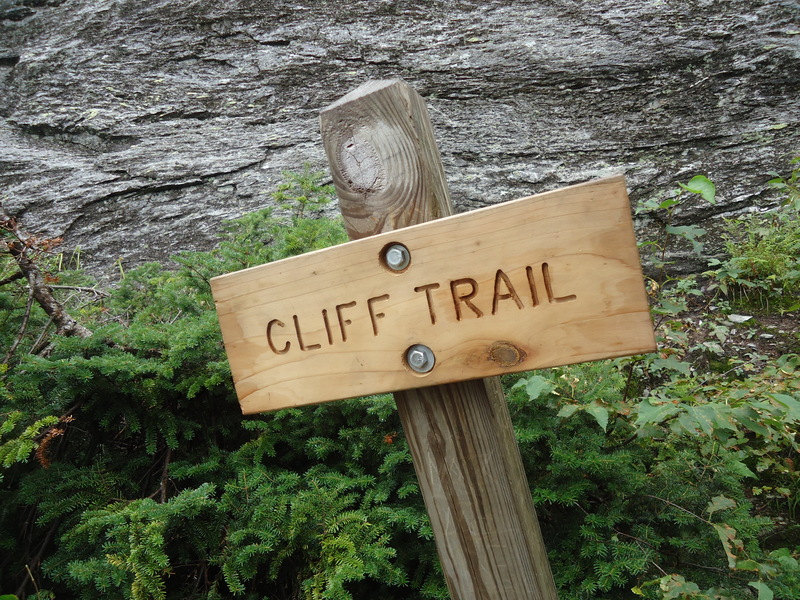 It was only at the base of the mountain that we learned we had just hiked the “Cliff Trail,” the only “DDD” Extremely Difficult trail on the mountain, headed straight for the summit. We cheered this accomplishment, hoping to replace the memory of how miserable (and irritated with us) they felt, with self-images of powerful summiteers: strong, brave and able. During the next two days, our appreciation of Stowe deepened. 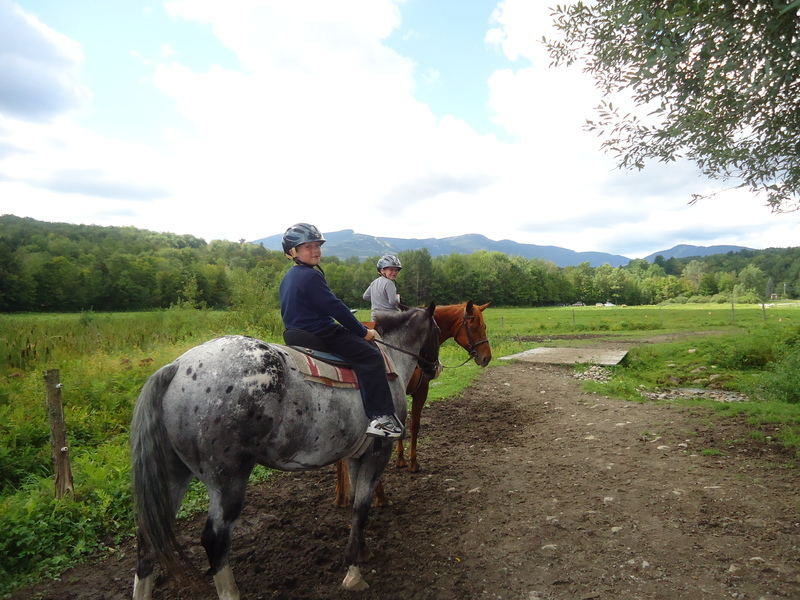 The Top Notch Resort & Spa arranged horseback riding for us, led by Mike from the Nordic Barn Recreational Center, over stream, through forest and across meadow. We rented bikes from Pinnacle Ski & Sports, and rode the Stowe Recreation Path from one end to the other, 10 miles round-trip. The path meanders over the stream with ten bridges, across vast open green spaces and through dense woods, while still managing to take you close to several restaurants. From our bikes, we picked up a slice of pepperoni for Emmett at Pie-Casso, and carried that with us to the Blue Donkey so the rest of us (who were reaching pizza saturation after two delicious nights in a row at Pie in the Sky) could have some of the best burgers ever tasted. At the part of the path closest to town, we encountered unexpected sculptures, whimsical, vibrant and provocative, surprising for such a small town. (Note to self: contact the Helen Day Art Center for tips on bringing more public art to my neighborhood.) 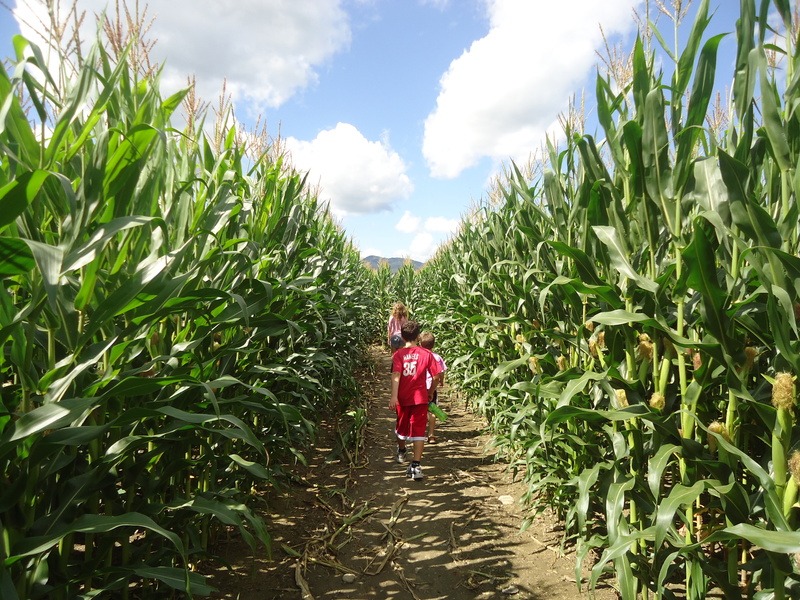 At the other end of the path, we tried out the local corn maze (realizing five minutes into it that it’s no fun to be lost in a maze). But we enjoyed talking with the granddaughter of the farmer who owns all that corn, which he uses to feed his dairy cows, who provide milk to the local Cabot Creamery to make cheese, which we ate on our numerous pizzas. Circle closed. It was time to move on. We left Stowe reluctantly, knowing we’d be back. Next time I’m making it to the summit. Looks like you and your family enjoyed a wonderful road trip. 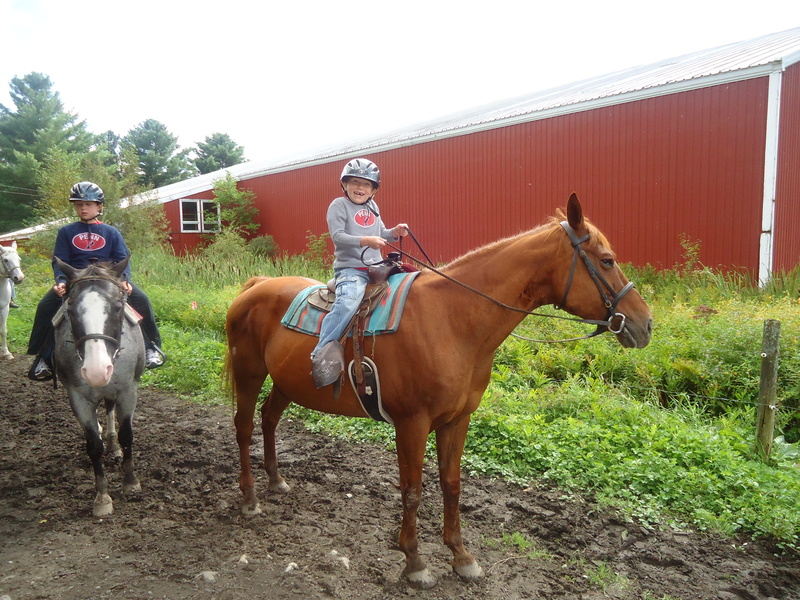 I’m a blogger, too, and was wondering if you would like to write a guest post about your horseback riding experience on http://www.writinghorseback.com? 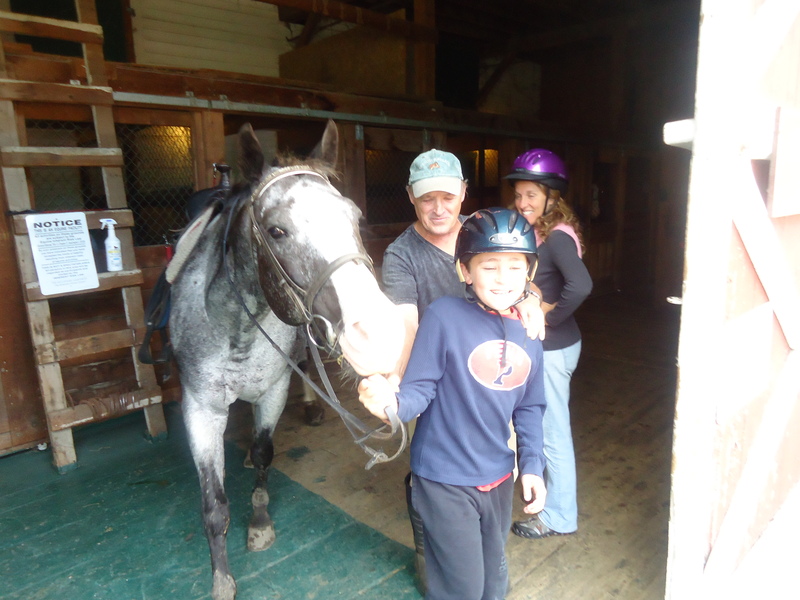 It’s an equestrian blog about horseback riding vacations for the general public.